Jimmy and Paul are over the other side of the World on a buying trip in the heart of the home of fireworks; China, and as the Chinese New Year fast approaches, time is short to get around all the factories on their list before the mass migration home for the Spring Festival begins. Here in the western world, we celebrate Christmas followed closely by the New Year and I do not know of many who have the whole of the holiday off but over in China, more than 90% will return to their homes from across the globe for this 15-day holiday to ensure that they get to share time with their families and loved ones. Fireworks are incredibly important to the people of China and they have been making them for centuries. The town of Liuyang is in the Hunan Province which is acknowledged as the capital of fireworks. This region is responsible for 60% of the $60 million industry from the thousand or so factories which cover the area. When you consider that the whole of the UK comprises only 209,000 km2 and Hunan is 210,000 you could literally fit our whole country in their province! Of the thousands of factories in the area, Jimmy and Paul have pretty much been to most but there are some which specialise in certain areas like fountains, roman candles and cakes and rockets are often made by separate companies. 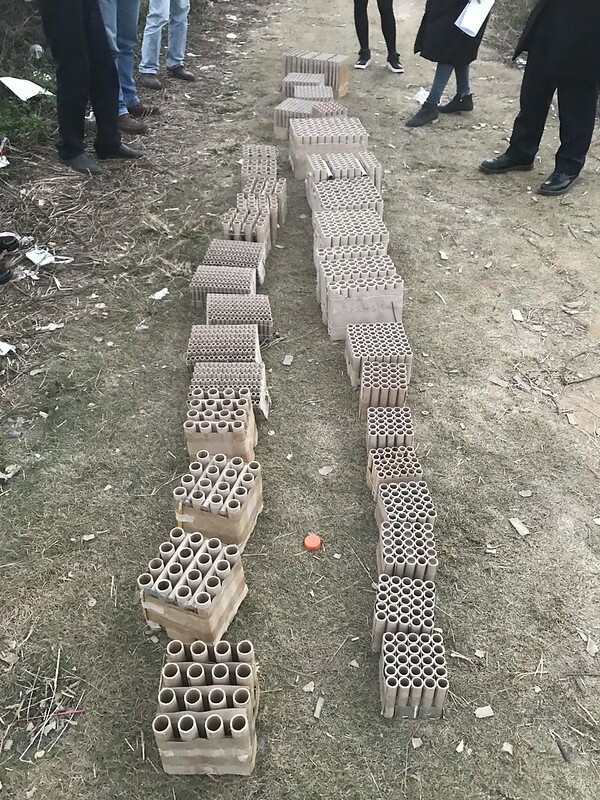 Over the years with the implementation of numerous rules and regulations regarding the transport of explosives and the safeguarding of the staff of firework factories has resulted in a great many of them working exclusively for the domestic market like the massive Spring festival which accounts for 40% of the gross sales of fireworks. In the images, you can see first of all the big Fountains in production – these are one of the biggest sellers of our range as the big beautiful 1kg bad boys last round 90 seconds and offer a great ground display and at the other end of the spectrum, there are the little teensy-weensy fountains, like the ones in the majority of multi-packs or selection boxes but they are absolutely essential for garden displays. When it comes to cakes or barrages (the same thing … some say that if they have different effects they have other names but it is all horses for courses) we have a couple of preferred suppliers who specialise in effects for roman candles. Which outlet we use depends on the type/weight/effects we need. On the other hand, ALL our rockets come from one supplier which offers us the best quality at the best price and moreover that we can trust that they will send what we have seen and not something random. Check out the casements ready for creating that special fanned barrage and the roman candle shot tubes. Cakes/barrages are created by bundling together roman candle tubes which individually fire off effects but when carefully fused in a specific order, become a cake fit for a professional show, without the price tag. Last night saw the first display of the World Firework Championship events in Blackpool fill the skies over the Irish Sea with colour and effects. The event pits the skills of pyro-technicians from across the World in this fantastic winner takes all spectacular. Kicking off with the team representing China from Tanghua Fireworks, the home of pyrotechnics, we were expecting the best they had to offer. Whilst they awaited the start of the show, there was entertainment from local radio station Rock FM in calm weather and a gentle rolling sea – and anyone who has visited the World Firework Championships in Blackpool before will attest to, this is not always the case! Each Friday over three weeks, the region will be treated to some awesome pyrotechnics from China, France and Canada before the finale evening when Titanium Fireworks put on a great show before they announce the 2015 winner. The display from China was very pretty with some beautiful falling leaves and horsetails in rich golds and bright and luscious reds. The slices were lovely and there was a nice shell which went from glitter palm to crossette which was a great effect. Midway through the display, there were some beautiful gold brocade bursts with blue tips and a brocade with a red glittering centre, which were awesome. Brilliant thick tailed spinners, lovely huge shell bursts with some beautiful fans to finish – a worthy effort. This year sees the 27th Annual Macau International Display Contest getting bigger and better than ever. The event is to be held on 5 concurrent Saturday’s throughout September and into early October with representing teams from all over the World. The host nation attaches great importance to cultural heritage. In fact, the firecracker industry used to be one of the biggest businesses in Macau, and fireworks, being a significant element in Macau’s cultural heritage, also has a long history in Portugal. Macau is a small peninsula in mainland China, just west of Hong Kong and is best known for its casino’s and widespread gambling establishments. It is listed as THE most densely populated region of the World with almost 700,000 living in an area just 30.3km. The region was originally a Portuguese colony between 1557 and 1999 when the region was handed back to China. In fact one of the most visited places on Macau are the ‘Ruins of St Paul’ which was originally the church of Mater Dei (Mother of God) and it was built-in the first part of the 17th century. To celebrate this ‘colourful’ history and cultural inheritance, Macau started to stage the annual “Macau International Fireworks Display Contest” from 1989 to demonstrate the unique vibes of Macau when the magnificent fireworks light up Macau’s stunning scenery. In previous years, all pyrotechnic materials used for use by the overseas teams had to be stored in one container which limited some of the performances as opposed to the local and regional teams who were able to ‘bring along’ whatever they wanted. From here on in, the visiting teams can use two containers and the regional and local teams must comply with the same amount of pyro. The rules of competition are clear that the teams must choreograph a firework display to music and the best example should give the impression of ‘dancing fireworks’ during their musical interpretation. The annual event not only lights up the nights of Macau, but also the hearts of spectators. Local residents look forward to the marvellous fireworks displays that add a joyous atmosphere to holidays and festivals. The Contest has also become an annual characteristic of Macau. Many visitors specially choose this time of the year to come to Macau to enjoy an exotic and romantic holiday. The Macau International Fireworks Display Contest has grown over the years into an internationally acclaimed event, one of the best of its kind and the local Tourist Office will continue to work towards advancing the event’s international status and reputation, with the vision to bring about the world’s most prominent international fireworks display. For the remainder of the time, there is plenty to do away from the fireworks and the gambling most notably enjoying the Grand Prix Museum and the Macau Wine Museum – what more could you want: Wine, fireworks and Cars. Amongst this year’s competitors are last year’s winners from China, Hunan Jingtai Fireworks Co Ltd and runners-up from Australia, Italy and Spain.